Creamy hummus topped with pine nuts, olive oil and paprika. 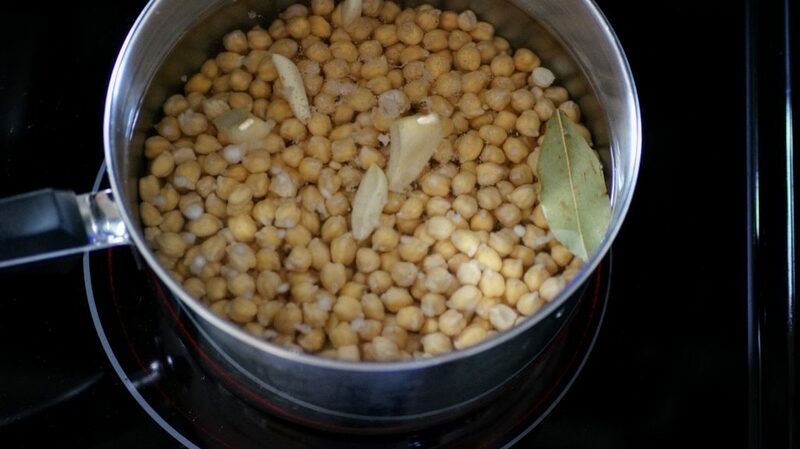 Stop what you are doing right this second and grab a bag of garbanzo beans and take them for a soak! Seriously, you NEED to make this hummus right away and you will thank me. I have strived to get the super creamy hummus many, many times. I will say, that having a very high powered blender or food processor is key, I recently got a Wolf Blender and couldn’t be happier with it! If you don’t have one, definitely invest in one that you can use for dips, soups, spreads and smoothies. It’s worth it! I grew up eating hummus, so basically before it was cool and popular. What’s not to love? Garlic, lemon, creamy beans, and tahini, it’s a superfood like none other! I’m glad it’s gained popularity and people have come to realize how amazing it really is for you. There are so many variations to making hummus, some that don’t even require chickpeas! This is a VERY classic Mediterranean version, nothing fancy, just simple ingredients that meld together so incredibly well. 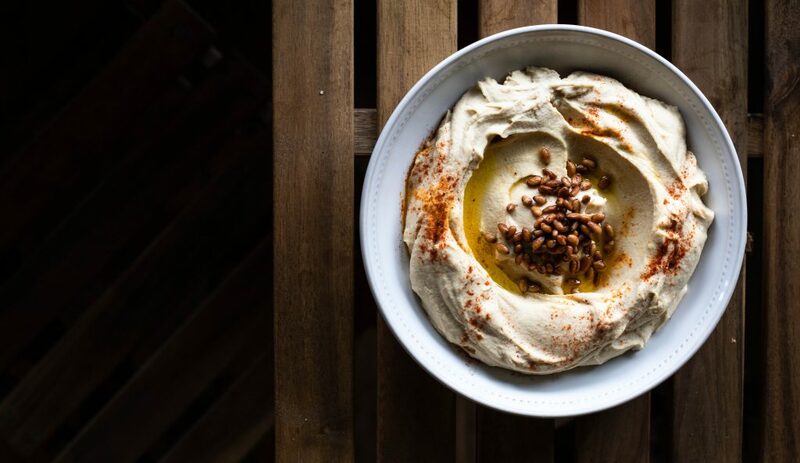 The key to this recipe is tahini, many recipes call for adding olive oil to the hummus mixture itself, traditionally it is just used to top the hummus. 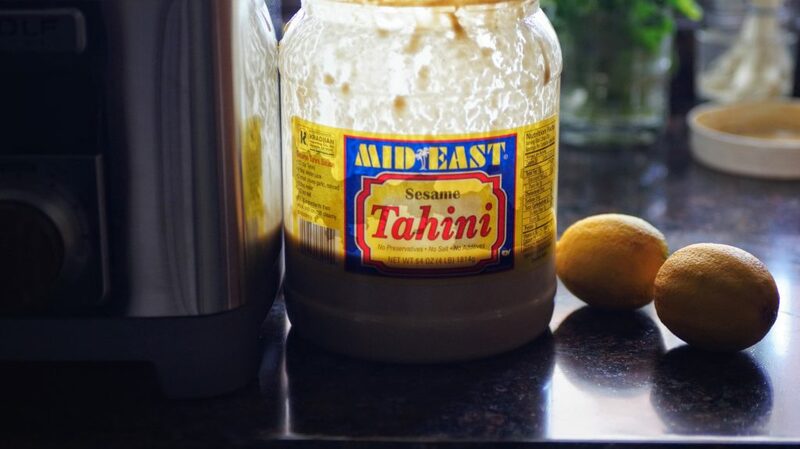 The tahini is what gives it that creamy texture and depth of flavor, so be sure you are using good quality tahini when preparing. This process of preparing the beans is very specific to making hummus, this creates a very, very soft bean that is perfect for hummus. If you’re preparing garbanzo beans for salads or anything else, these will be too soft. There are definitely shortcuts to making hummus but the classic way includes an overnight soak then cooking to ensure very soft and creamy hummus. 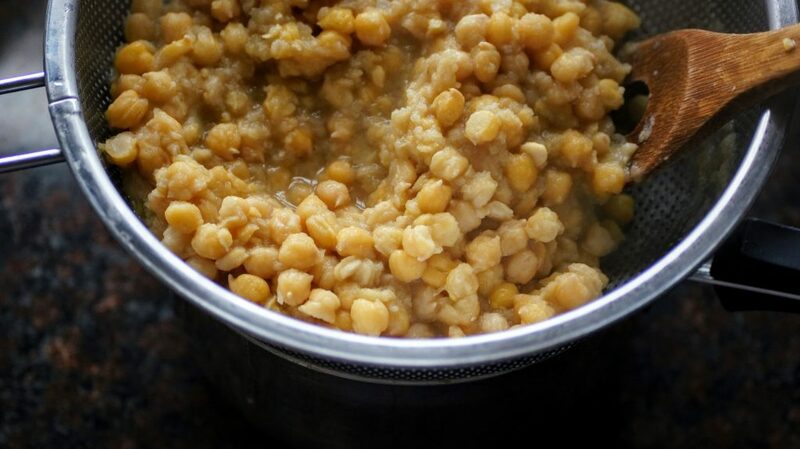 Another trick is adding baking soda to your garbanzo beans to help them soften even more, it changes the pH in the water creating a better environment for the skins to soften. The baking soda also helps to reduce the gas that beans will generally give you, bonus! 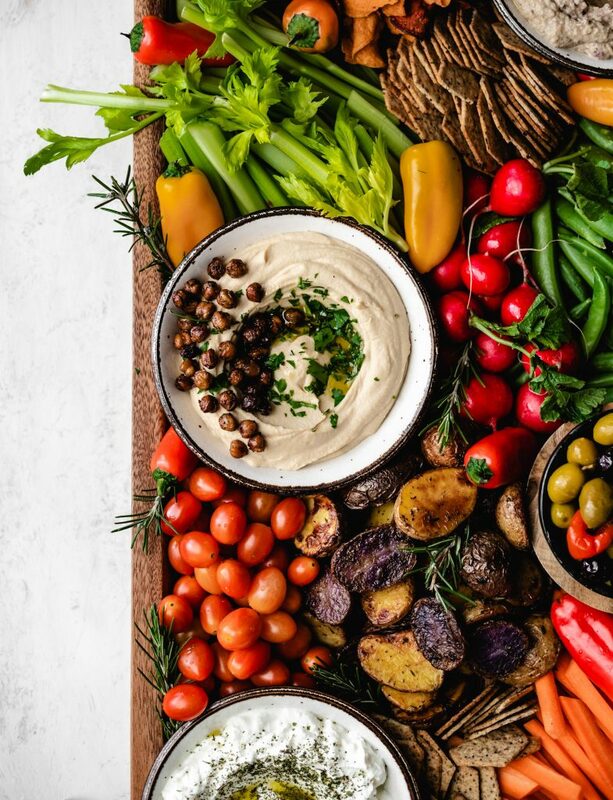 With all these great tips and tricks, you are just a few hours away from beautiful and delicious hummus and you will NEVER go back to store bought. I hope you enjoy this hummus recipe as much as my family does. Remember, eating healthy and balanced doesn’t need to be expensive. A bag of beans goes a long way and is a great way to enhance your family’s diet and menu. As always, I love seeing your creations! Be sure to tag me if you give this a try, Instagram @CosettesKitchen or post on my Facebook Page. 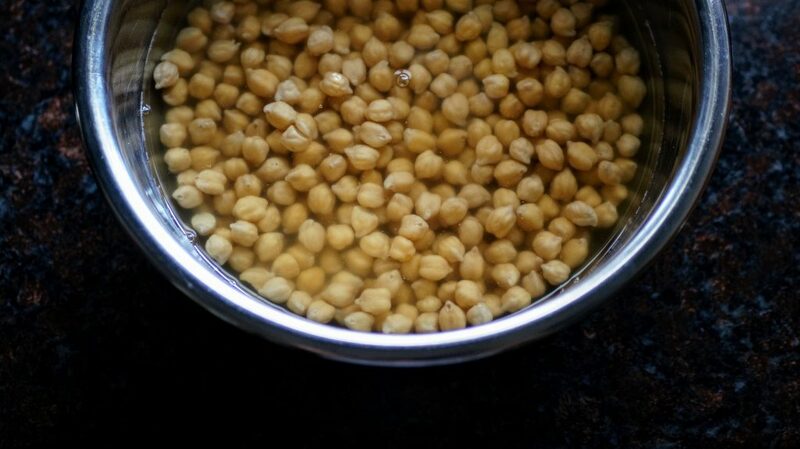 Get your garbanzo beans soaking in a large bowl of cold water, cover about 2″ and add in 1/2 tsp baking soda. Let sit overnight. 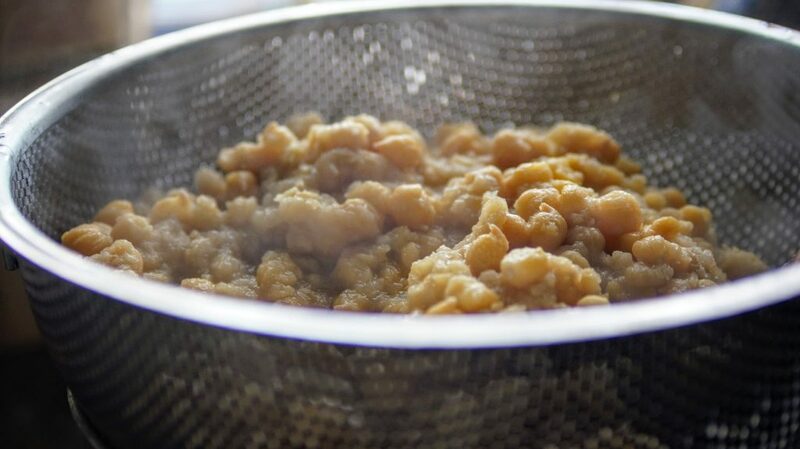 Day 2, drain your garbanzo beans that were soaking and give them a rinse. Transfer to a large pot, cover with water and add in 1 bay leaf and 2 cloves of peeled garlic and final 1/2 teaspoon of baking soda. Be sure to skim the white stuff that comes to the top of the pot while boiling. Skim and boil for about 45 minutes to an hour. Once your beans are super soft and skimmed, drain and remove bay leaf. It should be very soft. Finally, begin blending. You’ll add your tahini, lemon juice, ice cubes, water and beans together into your high powered blender to process. See full details below. Creamy hummus topped with toasted garbanzo beans, olive oil and fresh parsley. The night before you want to make your hummus, soak your dry beans in a large bowl filled with the beans and water to cover the beans about 2". You'll want to leave room for them to expand. Add 1/2 tsp of your baking soda to this mixture and let sit 8 hours or overnight. Add beans to a large pot, fill with water to cover the beans about 2" or more. Add in your bay leave and 2 cloves of peeled garlic and your additional 1/2 teaspoon of baking soda. 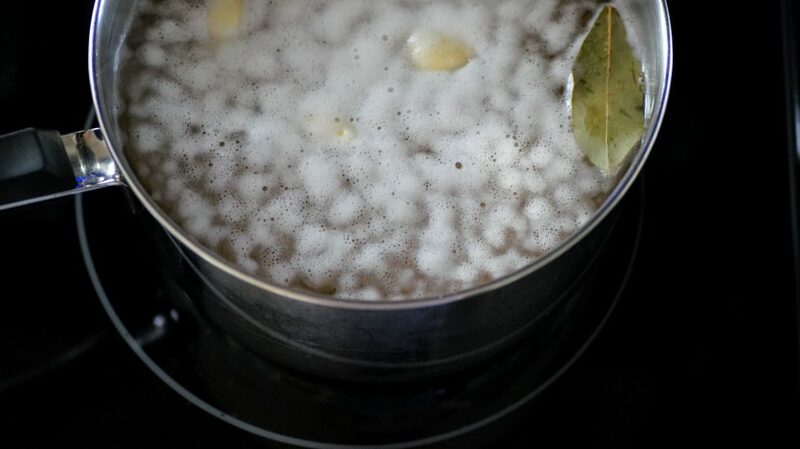 Bring beans to a boil on medium-high heat, continuously skimming the top foam. Continue this process for 45 minutes to an hour on medium-high heat. Once the beans are soft, drain (you can reserve the liquid if you'd like, this is aquafaba which is used in place of eggs in many dishes). Remove the bay leaf, keep the garlic cloves with the beans. In a high powered blender or food processor, add your beans, ice cubes, remaining 2 garlic cloves, tahini and lemon. Blend, add a few tablespoons of water as needed to thin. Be sure to remove the cap on your blender or food processor if you are processing hot food. I place a towel loosely on the top. Taste and add in salt and any additional lemon (to taste). Scoop out into dish, and top with your adornments. Enjoy with pita bread, veggies or chips. Hummus can be frozen in a freezer safe container, top with a thin layer of olive oil on top, seal and can be stored for up to 4 months. Remove from freezer and place in fridge when ready to use. I can’t wait to make this. Your recipe calls for 2 teaspoons of baking soda. In the directions I only see one teaspoon being used. When do you use the second teaspoon of baking soda? Gah! Thanks for the catch Nancy, it’s in the boiling pot of water, I made the edits. Let me know if you have any questions! Sometimes my brain moves faster than my hands. Hahaha! So is it supposed to be 1 tsp total or two? For the baking soda? 1 tsp total divided. The instructions will let you know to use 1/2 and 1/2 at 2 different stages. One for soaking and one for cooking. Hope that helps! Mmmm looks amazing and not as hard as I would have thought! Next time I’ll make hummus, this will be it! Sounds delicious! Can the beans be cooked in the Instant Pot? YESSSS! You can definitely cook them in there. They can get super soft in there! Watched your segment and bought some garbanzo beans that day and soaked them!!! Yay! so happy to hear, the full segment should be on this week.